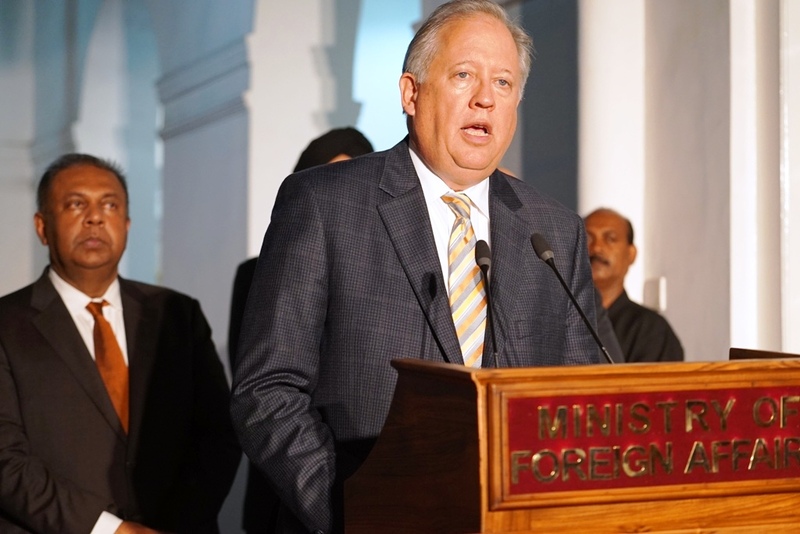 It has been an honour and a privilege to welcome Ambassador Thomas Shannon, US Under Secretary of State for Political Affairs- designate, to Sri Lanka, this evening. As all of you may know, Ambassador Shannon is the senior-most career United States Foreign Service Officer, and just the 14th in history to rise to the role of Under Secretary of State for Political Affairs. As far as US – Sri Lanka relations are concerned, this has been what can be termed a ‘milestone year’. -Ambassador Shannon’s visit follows a series of important visits from the US, since January of this year. -Just a few days following the Presidential Election on the 8th of January, as you may recall, Assistant Secretary of State Ms. Nisha Biswal visited Sri Lanka. In fact, her visit set the tone for the renewal of the long standing relationship between the United States of America and Sri Lanka. -This visit was followed by the visit of the US Secretary of State, Hon. John Kerry in May this year, the first official visit by a Secretary of State to Sri Lanka in 43 years. -The visit of Assistant Secretaries of State Tom Malinowski and Nisha Biswal in August, soon after the Parliamentary Election and the visit by Ambassador Samantha Power just last month, the second Cabinet-level visit from the United States in a matter of 9 months since the Presidential Election, helped consolidate our relationship. I think it would be appropriate to say that Ambassador Shannon’s visit, combined with all the important visits that preceded, indicates the level of excellence that relations between our two countries have now reached. I am confident that the deliberations during this visit will not only add to the strengthening of relations between our two countries but also give direction to the partnership between our respective Foreign Policy implementing agencies, namely, the US Department of State and the Ministry of Foreign Affairs of Sri Lanka. Ambassador Shannon’s visit and the nature of support that the US is willing to provide to Sri Lanka is most encouraging as we proceed on the journey that we began on the 8th of January to make our country a truly peaceful, reconciled, prosperous nation which abides by the best democratic traditions; promoting and protecting the human rights of each of our citizens and celebrating the multi-ethnic, multi-cultural, multi-religious and multi-lingual nature of our society. In our meeting this evening, we discussed a series of areas where we could work together to ensure that the people of our country benefit from the changes that are taking place in Sri Lanka and from the peace dividend. We discussed ways of making our partnership stronger, including enhancing bilateral trade and investment; and maritime cooperation including Sri Lanka’s participation in the ‘Our Oceans’ Conference. These four areas were decided upon after discussion with both President and Prime Minister during the last few months, in the context of ways and means of developing the US-Sri Lanka relationship in line with the reform agenda of the Government and the requirements of the people of our country. Ambassador Shannon and I also decided at our meeting today that the Partnership Dialogue will be launched in Washington DC in February of next year. As I mentioned before, Ambassador Shannon arrived in Sri Lanka today. This meeting at the Foreign Affairs Ministry was his first since his arrival this evening. Tomorrow, he will travel to the Eastern Province. On Wednesday, he will call on the President and the Prime Minister. He has also undertaken a speaking engagement at the Lakshman Kadirgamar Institute on the same day. I am also grateful to Ambassador Shannon for undertaking this visit. I look forward to staying engaged with him, and to work closely with him to further enhance US – Sri Lanka relations along the positive trajectory on which Secretary Kerry placed our relations during his visit in May this year. At this point, I would also like to convey my appreciation to Ambassador Atul Keshap and his team in Colombo for all the tireless work that they do to make the bonds between our two countries grow stronger with each passing day. 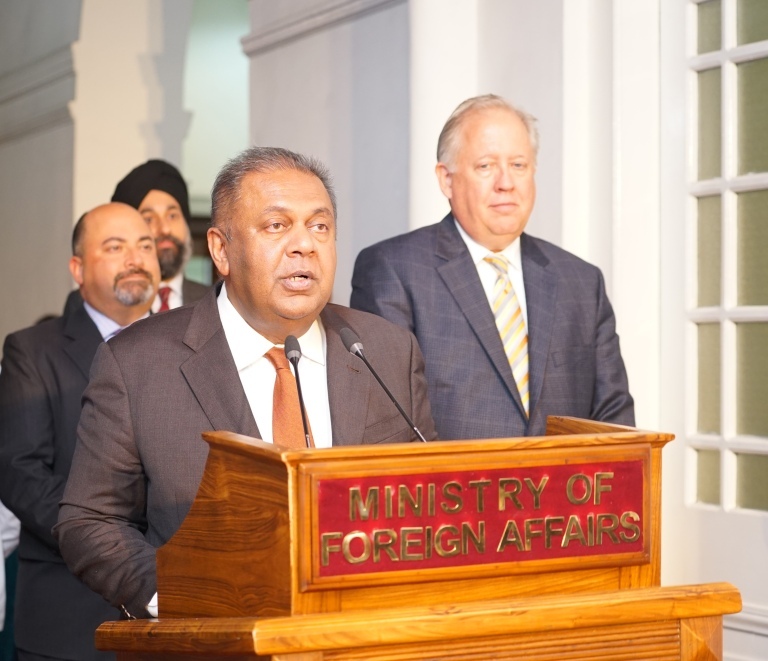 I wish Ambassador Shannon and his team a very pleasant stay in Sri Lanka and now I would like to invite Ambassador Shannon to say a few words to you. I am happy to be in Sri Lanka for my first visit during this time of progress and opportunity. Sri Lanka is moving forward, and its leaders and people are now working together to usher in reforms to put the country on the long-term path to peace, stability, and prosperity. I just had a productive meeting with the Foreign Minister. I am thankful for his hospitality, which I think reflects the reputation of the Sri Lankan people as kind and generous hosts. We discussed ways the United States could “stand with Sri Lanka” as Secretary Kerry put it, and concrete steps to further our partnership. The people of Sri Lanka and the United States have been friends for generations. We have benefited from trade and business but also from cultural exchanges and personal ties, whether Americans who made a home in Sri Lanka, or Sri Lankans who have made their way to the United States. Sri Lanka’s contributions to the development of a regional consciousness – one that promotes the values of democratic governance and respect for human rights, freedom of navigation, sustainable development, and environmental stewardship are noteworthy. We welcome Sri Lanka’s contributions to global peacekeeping and humanitarian disaster assistance and believe that your armed forces can also play a constructive role in ensuring a bright future. In May, Secretary Kerry and the Foreign Minister announced that our two governments would launch a Partnership Dialogue to build on that history of exchange and to intensify our cooperation across the board and to further enhance our relationship. I am pleased to announce with the Foreign Minister today that the first meeting of the U.S.-Sri Lanka Partnership Dialogue will take place in February 2016 in Washington, DC. This annual meeting will provide an opportunity to discuss all aspects of the relationship and ways in which the United States may be able to engage directly with the people of Sri Lanka and the Government. These efforts will be wide ranging, to the benefit of both countries. Our cooperation benefits communities where returnees are facing hardship. We will assist reconciliation and broader transitional efforts at the household level, community level, and national levels. We will foster greater trade and investment to raise incomes, create jobs, and improve standards of living in both countries. I look forward to what promise to be very productive meetings during my time here.